First of all: apologies for the lack of posts in the last couple of weeks, it’s been a busy period for me. As it is, I’m still snowed under and so this post is just a relatively quick entry based on an interesting translation project I completed a while back. The text was a French translation of a folktale from Haiti which was itself a translation from the Creole version: the official language of Haiti along with French and the chosen language of communication with its oral nature. One of the greatest traditions in Haitian culture, and the one that is central to this translation, is that of storytelling which, in rural areas of Haiti, is an integral part of the cultural heritage of a country where families must create their own entertainment in the evenings. 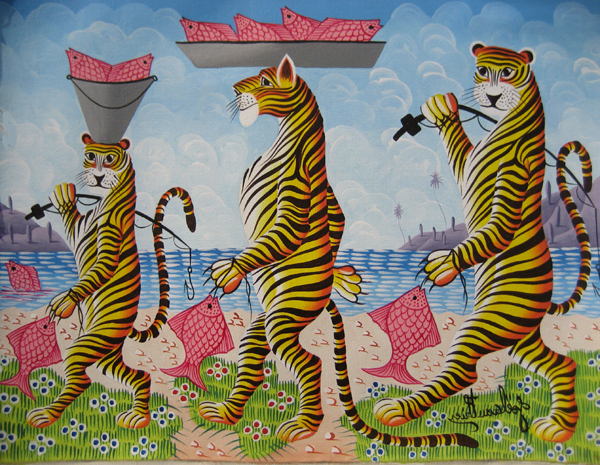 This tale shows many of the typical qualities of a Haitian folk tale: there is a use of humour that often transfers surprisingly well to English, certain fantastical elements (accounts of magic, wild beasts and even encounters with God are common, and this tale is no exception with the inclusion of a tiger: a somewhat mythical beast in Haiti as no tigers have ever been known to inhabit the country), dramatic changes in narrative linked with the improvisation of a storyteller, and finally examples of the storyteller addressing his audience directly. Many of these features will undoubtedly seem unusual to a reader unfamiliar with the underlying context but the insight that they offer into a completely different culture is fascinating. In the translation, I tried to embrace this sense of strangeness by using unfamiliar syntactical formations that often mirror Creole word order and phraseology as well as using ideas from Appiah’s article ‘Thick Translation’ (well worth a read! ), which suggests using annotations and glosses to locate the text in a rich cultural and linguistic context. Well, enough already, here it is: the story of the riddle solver and the child. Enjoy! The Riddle Solver and the Child. There was once a man who had three sacks of money. He walked, posing riddles, searching for somebody capable of posing him a riddle that he couldn’t solve and to whom he would hand over the money. He went everywhere. When he said yes, the child went into the house. There were two buckets full of water; he decanted all of the water in the containers and, when he had finished, he took the ‘kras’ and carried it to the man. “Uncle, you don’t know the answers; let me give them to you. The child let him leave. But the child’s father had quite a long piece of chain in the house. The child, meanwhile, was sitting beside the fire that was burning near to the house. “Papa will have words with you, for I think it’s about ten months since he gave you money to bring him a beast…” (The tiger, who was approaching at top speed, stopped). “Of course, I know that Papa won’t take this little tiger that you have brought him.” (The tiger stays still). When the tiger saw the child approach with the bit of chain, he started to run. The man took to his heels. When the tiger saw the man running behind him, he believed that it was in order to catch him and he ran even faster. The man quickened his pace as well. They ran, one chasing the other. And that is how the tiger, followed by the man, fell into a chasm where they were both killed. When the parents arrived to the place he had hidden the money, they stood speechless. In rural areas, water from ponds and rivers is put to settle with the cacti when it is too muddy. A little bit of mud is always left at the bottom of the container, called ‘kras’ in Creole. As ‘kras’ can also mean ‘a small amount’, you never ask for a ‘kras of water’ but rather a ‘drop of water’. The word ‘kras’ is reserved solely to refer to food, as it can also mean a few “crumbs”, just enough to dirty a plate. In rural areas, the child calls all men ‘uncle’ and all women ‘mother’. Children themselves are always named ‘pitit’, meaning ‘child’. ‘Jiggers’ is the nickname given to ‘chigoe fleas’. These are a type of parasite causing disease in tropical areas by burrowing into people’s feet when walking barefoot and they must be removed daily. In rural areas, especially in mountainous regions where it is quite cool, a fire permanently burns close to the house and the children warm themselves by it. There are no tigers in Haiti. In fact, ‘tiger’ is a generic term used in Haiti meaning a wild, ferocious animal of the cat family. The term ‘little’ employed here is very important. To deny the appearance of a being, whatever it may be, is to demonstrate a transcendental strength. CAT tool evaluation: WFA and Trados – David and Goliath?